Power failure is causing severe rail delays in the East Midlands. No trains ran through Nottingham, Derby, Leicester and the surrounding areas from about 17:00 GMT due to a control centre power loss in Derby. East Midlands Trains said power had since been restored and trains were running again but National Rail said to expect delays of up to 60 minutes. East Midlands Trains said while its trains were disrupted passengers could use their tickets on other lines. Services are expected to be affected until "the end of the day", the company said. 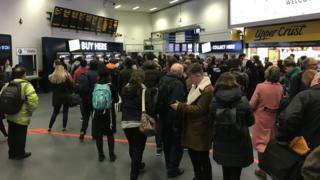 Deborah Perkins, of Arnold, Nottinghamshire, who caught the 16:34 train from London to Nottingham said the service did not move for about an hour shortly after leaving the capital, but passengers "seemed fine". "Generally I think people were a bit miffed but we were offered water and biscuits. There is no rioting! It's generally quite calm." She said it was "a bit of a nightmare because I will be back an hour later" but it gave her a chance to get more work done. East Midlands Trains said further information about the disruption and how to claim delay repay compensation can be found on its website.